The original intent for this blog–and the name–was proactively arresting a sort of bulbous-headed mental over-saturation to which I am subject. My head fills up with excitement, or interest, or sometimes boredom, and the compensation for my hyper engagement is usually a mixture of disaffectation and jawing the ears off of anyone in my reach. I like to teach, and I like to sell, and somewhere at the heart of that twining hydra is a fundamental urge to learn and comprehend via reflection; I show other people something, watch them internalize it, and in so doing come to better understand that thing myself. I think about new things as though I’m explaining them to some combination of novice/fellow enthusiast/my wife/potential customer. The urge to convey information is so strong that, over Christmas, I sold a woman at the Barnes and Noble several Halo books—I do not work at our Barnes and Noble (but, honestly, you’d be hard pressed to prove that anyone does). These adorable bastards are wee. After completing the models, though, there was this game of Civ V to finish, and I profoundly underestimated how long 70 turns in that game could take. By the time we punched through the aggression of Ethiopia and political machinations of Singapore, the cold Stacey’s nursing had laid her low. We did talk about some systems, because my wife is long-suffering and patient even in illness. But I’ve still got this mass of unpainted plastic waiting to do raw battle, and with a Hordes and a Warmachine box there are two different systems to explore, and all of this works better if I’m playing with someone, so that I can react to strategies. I’ve played lots–just, so many–of games by myself over the years, because I was a child of singular interests and it was a different time to be a nerd way back when. I’m good at giving myself a challenge, and enjoy the mental flexibility entailed by competing with myself; been doing that since my dad taught me chess in preschool. It is, however, difficult to really challenge or surprise oneself in a game that’s just being learned. Hasn’t stopped me from setting up a game, but my mind is ravenous with a hunger to really get into the meat of learning the game, and feels that there’s a certain process which must be followed to satisfy that urge. Also, I want these models primed and painted, but feel that they need to be fairly divvied up in a domestic sort of way, which feels like it happens on the other end of test games. It not only feels unfair for me to paint both boxes, it’s unrealistic–my wife is the superior and faster painter, so things will get done much faster if she’s taking point on one of the forces. I have designs on how to paint both sets, but they’re amorphous and will likely remain so until I know which group I’m actually responsible for. The game is Pacific Rim. It’s just Pacific Rim. 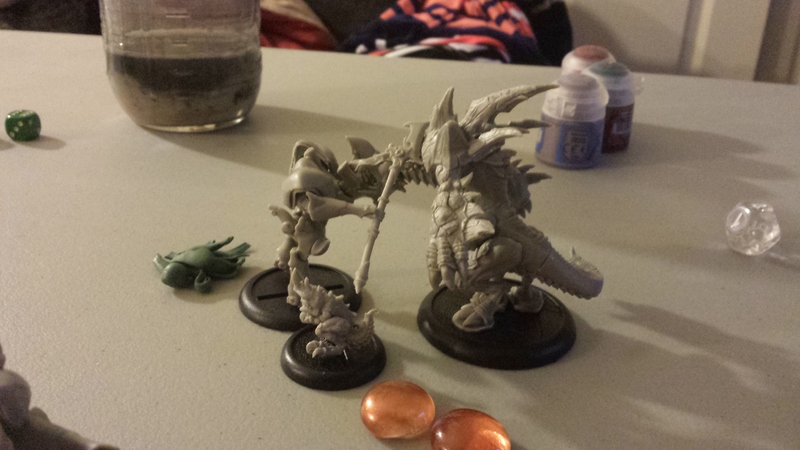 Posted in Hordes, Navel-Gaming, Warmachine.Tagged Hordes, Solitaire, Warmachine, Wife.